I had read her story for years. Then, out of nowhere, I remembered her and googled her name. I was heart broken to hear the news of her passing. I then found this site and read about the photo taken before her death. When I saw the rainbow…..I lost it. I don’t even know Alicia, but yet, I feel like she was my best friend. What an angel she was. Christina, I see the double rainbow, too. God gives us many gifts when we let ourselves receive them. Alicia died far too young, but her story has touched me from the first time I stumbled upon it while checking SFGate online for a political story. What incredible spirit that young woman had and it lives on in her family and friends and thousands of strangers who were and are lucky enough to know her through her words. I’m so sorry that I couldn’t make it in person. My heart and mind was there with all of you though. I think that the rainbow was a sign that Alicia’s spirit and courage are there for us. I did pick up a copy of her bookl it is incredible. I would advise people to read it. There are gifts… some are beautiful… some are subtle as a whisper and they are all Alicia. Peace. 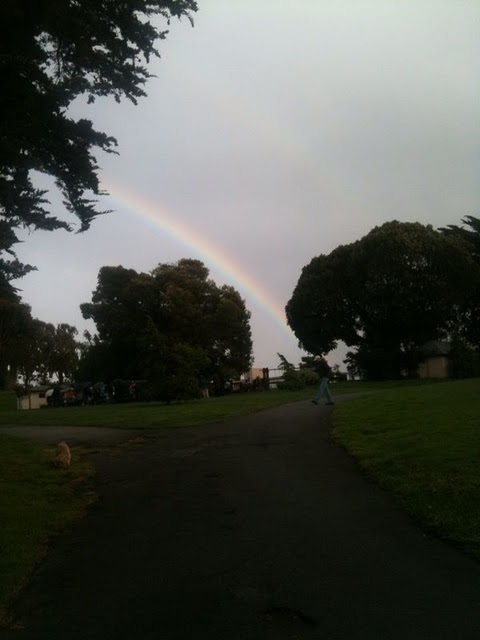 I don’t know if you can see it, but I think I actually see a DOUBLE rainbow in this photo. The second rainbow is above and slightly to the right-it’s very faint but I see it pretty clearly (either that or I have double vision.) How beautiful for Alicia. I wonder if she liked Double Rainbow ice cream.